A man who stabbed a fellow dog walker in the neck in an "unprovoked" attack has been jailed for more than 10 years. Todd Sadlik-Stephenson, 25, targeted the 35-year-old on Melton Road, East Goscote, Leicestershire, on 14 October. Police said it was only first aid given by another passerby that saved the victim's life. Sadlik-Stephenson pleaded guilty to grievous bodily harm with intent and assault by beating and was jailed for 10 years and six months. 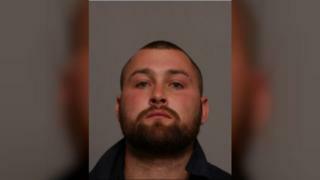 Leicestershire Police said Sadlik-Stephenson - who admitted the offences at Leicester Crown Court - was walking his own dog on Melton Road when he launched the attack from behind. He also attacked the victim's wife but fled when others intervened. In a statement issued by police, the victim said: "I don't think we'll ever understand it fully or comprehend why someone would do this to a complete stranger. "It was a completely unprovoked attack on a couple enjoying an early evening stroll with their dog. "I'm still on the long road to recovery, while my wife had to witness the most unimaginable horror - stemming the bleeding of a loved one should never have to happen." Det Insp Tim Lindley said: "There is little doubt in my mind that if it wasn't for the intervention of a member of the public who provided first aid at the scene, this would have been a murder investigation. "This was a horrific attack which has had a substantial and lasting impact on the victim, who is still recovering from his injuries."